Jews love to use salt at meals- but why? Given little to no attention, this custom actually has an interesting backstory- not about people, but about water. The verse says “on all offerings you shall bring salt” (Vayikra, 2:13). Being that our tables are symbolic altars, the rabbis extended the commandment, requiring salt for our meals as well. 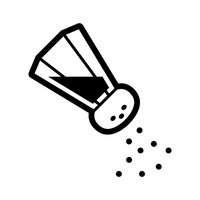 But in a peculiar description, the verse first calls salt “the salt of the covenant”. What covenant is this talking about? Rashi quotes the Midrash which explains that during the first days of Creation, Gd separated the upper and lower waters. Seeing it as an unfair division, the oceans (lower waters) pleaded with Hashem: ‘why should we be subject to abuse of fisherman and swimmers, while the upper waters get to dwell constantly near You in the Heavens?’ In response, Hashem guaranteed that they too shall be rewarded with aspects of Holiness- during the yearly water libation celebration on Sukkot (“Simchat Beit HaShoava”) and along with every Temple offering, in the form of salt. This is the “covenant” referred to, yet it still seems unfair- the upper waters are constantly imbibed with Holiness- but the lower waters only merit it occasionally?! Furthermore, what does it have to do with our meals, nowadays? When we remind ourselves of this “covenant” by dipping our bread into salt, what we declare is that we are not complacent with everyday activities. Instead, like the water, we yearn for opportunities of holiness. Although at the present moment we may simply be eating, what we have in mind is that our eating should strengthen us for greater purposes- to use our sustenance for holier things. And when we see our everyday activities within the context of that holy mission, then we too reside constantly with Gd as well. When we exercise- we do so in order to do good for others. When we sleep- we do so to be well-rested and focused during our prayers the next day. In this way, every act is a holy act, not just those in front of a prayer book, but even those we do at the table- when we eat our bread with a little salt.